Telstra's plunge stole the limelight this week, but there was one telco at the smaller end that did well for investors. Read on for the results highlights of this stock, and for three other standouts, picked by Simon Shields, Monash Investors; Alex Shevelev, Forager Funds; Andrew Smith, Perennial Value, and Tim Hannon, Newgate Capital. MNF Group is a telco we hold that owns and operates Australia’s largest interconnected IP voice network. They also have overseas operations. It is asset light, in that they lease, rather than own, fibre and data centre space. They also develop their own software, rather than pay vendors. MNF’s proprietary software is not only the key to their high margins, but also is its differentiator to gain and retain clients. Such value-added services are not widely available from traditional telcos. Partly due to the roll out of the NBN, the large listed Australian telcos (Telstra, TPG and Vocus) are reporting disappointing earnings, increasing capex and/or cutting dividends. By way of contrast, MNF grew organically in each of its three divisions: domestic retail, domestic wholesale, global wholesale. Over the year revenue grew by 19%, EBITDA and NPAT by 34% and EPS by 29%. The dividend was up 18%. There was an upbeat outlook statement albeit without metrics. As usual, MNF will wait until the AGM in late October to provide guidance. The stock rose on the result. Strongly growing, scalable, asset light businesses typically trade on lofty multiples. By such standards, MNF’s price at 22x consensus FY18 EPS is modest. Broker coverage of the stock is increasing, and this will help the market understand the business better, leading to a greater multiple over time. Service Stream delivered another result worth writing about. And it was a very hard one to fault, coming in above expectations already nudged higher in May. Revenue rose 14% to $502 million while earnings before interest, tax, depreciation and amortisation (EBITDA) climbed 35% to $48.4 million, a record 9.6% margin. Earnings per share increased 50%. Meanwhile working capital continued to improve; free cash flow again exceeded net profit. The Fixed Communications division completed more than half a million NBN customer activations and improved margins by 2.4% to 11.9%. In fact, revenue and EBITDA grew in all divisions. The acquisition of Techsafe, an electrical inspection business, is still to meaningfully contribute. Management expects further growth in revenue and profitability this financial year. This is all a far cry from where the business was just three years ago. In August 2014 Service Stream reported just $17 million in EBITDA, a paltry 4.3% margin, and had just raised $19 million to stave off the banks. On the day it released its results, the company had a market capitalisation of only $80 million. Today it is valued at more than $500 million. But has it all gone too well? Expectations are for close to $56 million of EBITDA this year. That would put the business on a price earnings multiple of close to 16 times. And let’s not forget that the nbn, contributing 47% of revenue last year, has planned for peak activations next financial year. Forager still has a meaningful investment in Service Stream, but the equation is more balanced than three years ago. A small cap stock which has stood out to us early in this reporting season is RPM Global Holdings (RUL). We first wrote about this stock six months ago after a positive 1H17 result, and you can access our previous commentary on RPM Global here. Pleasingly the sales momentum has continued since then with the FY17 update showing license fee revenue of $23.7 million (double the sales of the prior year). Given many of these sales were late in the period we should see the associated consulting sales and recurring maintenance fees in FY18. We believe this sales outcome reflects the lagged benefit of the very large R&D investment made by RUL during the downturn as well as a more buoyant environment for their mining customer base. The release referred to “the single highest value software license transaction ever completed by the company”. Given this occurred at the end of FY17, a large chunk of the revenue will carry over into the new financial year. This now provides investors with a strong degree of sales visibility for FY18. RUL has $20.2 million in cash, which will grow further with the $10 million due from recent sales. 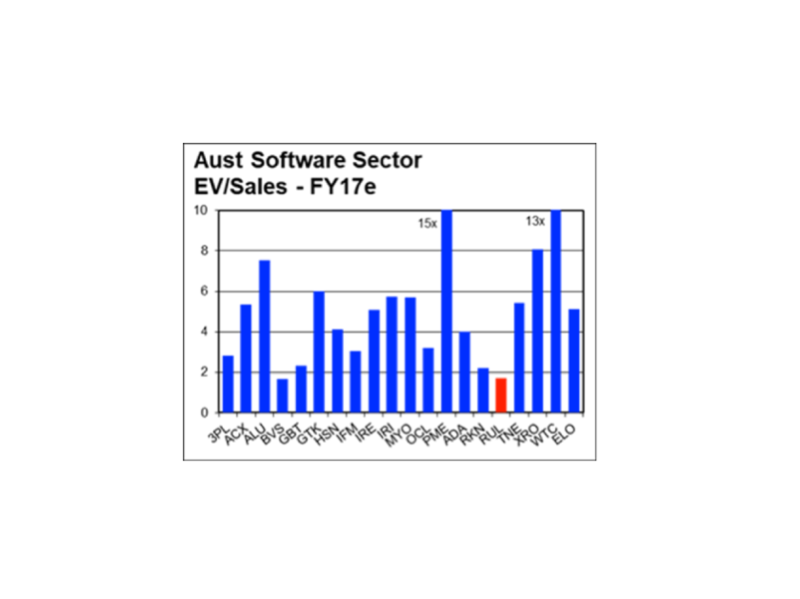 The strong balance sheet and sales outcome makes RUL stand out as excellent value compared to other software companies on an Enterprise Value/Sales basis (as shown below). Source: RUL Announcement. Enterprise Value/Sales data from independent research sourced by Perennial Value Management. RPM Global Holdings is held as a high conviction idea across both our Small and Microcap funds. The fact that shares in RPM Global Holding (RUL) may have been mentioned should not be interpreted as a recommendation to buy, sell or hold that stock. Short-termism is a significant feature of equity securities markets – driven by investors’ expectations for short-term results as well as the incentive structures of fund managers and company management. We believe this short-term perspective provides opportunity because it can ignore the value of companies that are continually compounding their earnings to create long-term value. To illustrate we highlight the full year result of Treasury Wine Estates (TWE) – an investment where a genuine longer-term view is required. The analysis of TWE’s full year result, as well as the transcripts of the earnings call, illustrates our point. There were very few questions about the company’s strategy. Most of the focus was on whether TWE will meet its next six-months earnings forecast, or on minor details that had little obvious economic relevance. This market short-termism then seems to translate into a fixation on next year’s ‘price earnings multiple’. This is very relevant for TWE, because its 2018 price earnings multiple is 29 times – which is much higher than the market multiple of 18 times. This comparison, in turn, leads to the conclusion that “TWE is expensive” and is not a good investment. The problem is that this is what the market has been saying about TWE the past four years, as the stock has tripled from $4 to $12. Many analysts are still saying TWE is expensive, and we think they will again prove to be incorrect over the long term. We argue that TWE should not be judged on near term earnings results, but on the merits of the long-term strategy of the company within the strong growth of the global wine industry. TWE has executed on a strategy to lift operating margins and return on capital. To achieve this, the company has repositioned and consolidated brands, optimised their supply chain and implemented management processes supported by a global information technology infrastructure. Also, importantly, they have invested in building their own global distribution network. TWE’s control over their own distribution avoids having to use third party distributors. This means margins, but more importantly closer proximity to its customers and control over its brands. We argue there is still more to come from TWE on a long-term view. Firstly, we expect TWE management can continue to operate more efficiently and increase margins and return on capital. Management are targeting operating margins to lift from around 20% to 25% over the medium term. Secondly, we expect the company to enjoy significant volume growth because per capita wine consumption is increasing in every market TWE is exposed to. To illustrate the potential we highlight China, an early stage wine consumption country. Chinese wine consumption is 2.1 litres per capita, compared to developed markets such as Australia at 26.8 litres, the UK at 22.7 litres and the USA at 11.8 litres. We do not expect China to resemble developed market consumption levels for decades. However, it is still growing rapidly. Just five years ago consumption was just 1.6 litres per capita. It is conceivable that per capital consumption moves much higher over the long term, translating into an enormous increase in volume growth for TWE. Asia represents $150 million of earnings presently, it is possible to see $1 billion earnings on a long-term view. To provide context, TWE’s total global operating earnings are $563 million. In conclusion, If TWE can continue to improve its operational efficiency and grow volumes in line with global industry growth, we can see the stock price tripling again over the medium to long term. Whether it achieves this result will be a function of executing on their clearly enunciated strategy and for wine consumption to keep growing as it has for the past two decades.